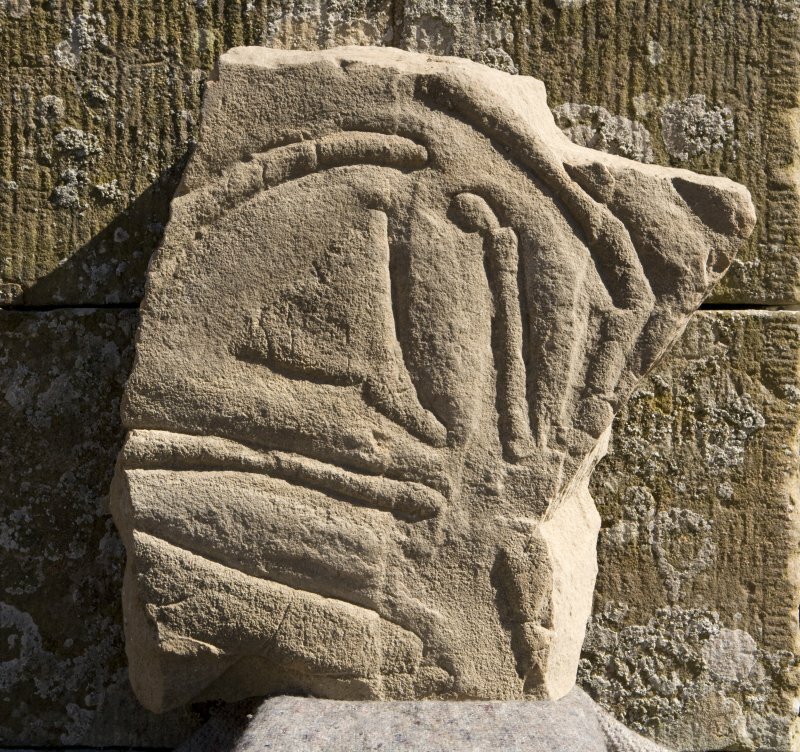 Photograph of Pictish symbol stone. Present location: fixed (upside down) to a garden wall at the rear of the house. Evidence for discovery: found around 1850 ‘near the site of an ancient settlement’ on the sandy links close to the shore, the stone was used as part of the covering of the mill lade at Sandside Farm. In September 1889 it was extracted and taken to Sandside House. Finely incised on a smooth broad face of the slab are the triple oval symbol above a disc with indented rectangle, a mirror and a comb (no teeth depicted). Within the disc of the disc with indented rectangle there is a double circle offset from the centre of the disc. Evidence for discovery: found amongst rubble near the house. 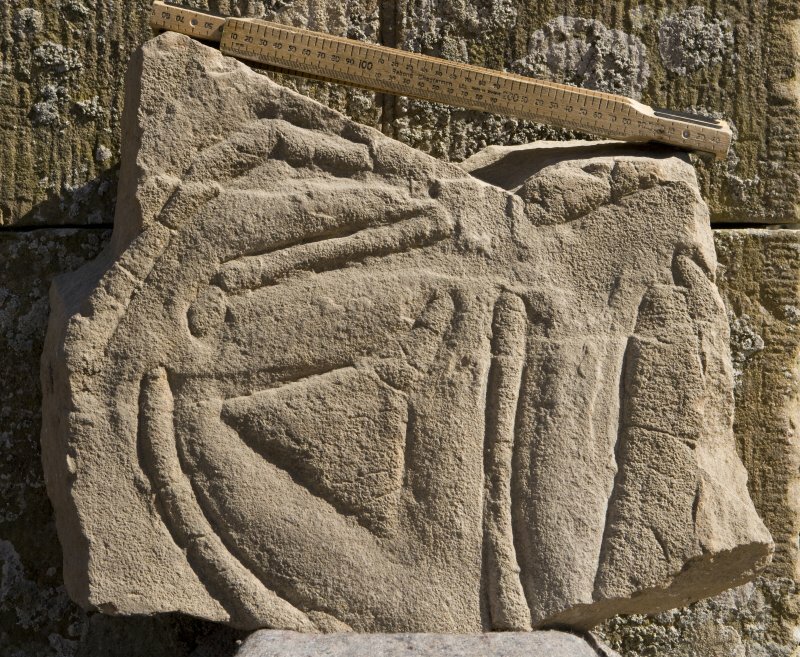 An enigmatic fragment incised with what may represent the arm of an encircled cross. 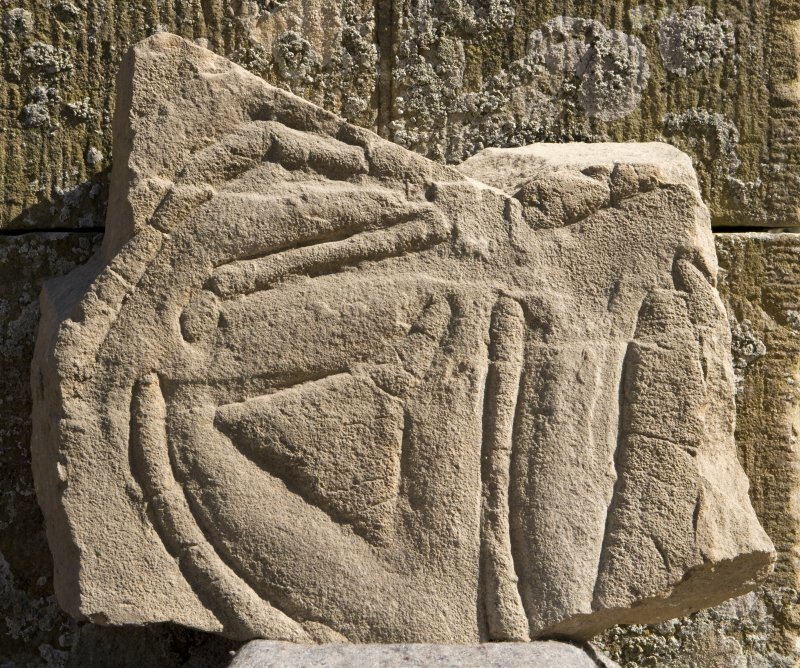 (406) At Sandside House there is a stone incised with symbols, which was found built into a stone dyke near Shurrery, not far from Tigh a'Bheannaich, which was evidently the site of a chapel or religious foundation. It is a rectangular block of sandstone, 2' 5" in length, 9" in breadth, and 8" in thickness. On the face of the stone is incised a small stemmed circle or orb, 4" in diameter, containing an equal-armed cross. The stem is 3 1/2" in length, 1" in breadth where it joins the circle, and 1 1/2" at base. Beneath, and occupying the breadth of the stone, is a plain circle with a diameter of 8". 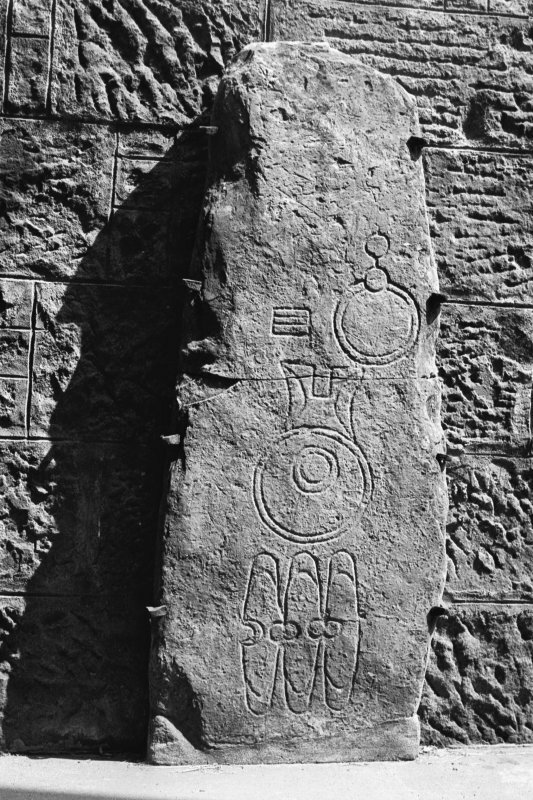 Front.-At the top, a symbol (unnoticed previous to the discovery of this stone), consisting of a horizontal row of three flattened ovals, joined together in the middle by pairs of small circles, and having a double outline at the tops and bottoms of the ovals; below this, the mirror-case symbol; and at the bottom, the mirror-and-comb symbol. Both stones are as described. Visited by OS (N K B) 25 November 1964. A: A Class I symbol stone found about 1853 on the links by the shore at Sandside (NC 95 65) near an ancient settlement (presumably NC96NE 9) and removed firstly to Sandside Farm to cover a mill-lade, and then, in 1889 to Sandside House where it is placed within a wooden frame against a wall at the east side. 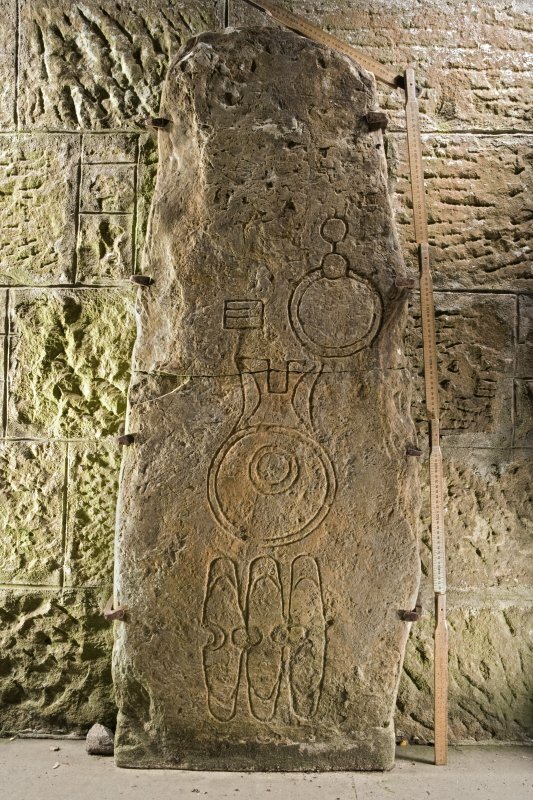 It is a rectangular slab of local sandstone 4ft 8 1/2ins long, by 1ft 11 1/2 ins wide and 3 1/2ins thick, with incised symbols on one face only. 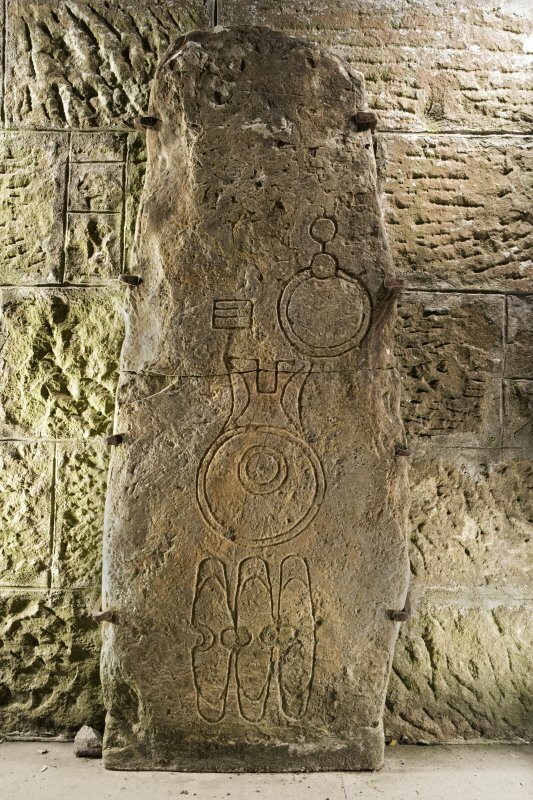 The symbols are a horizontal row of three conjoined ovals, a mirror-case and, at the bottom, a mirror and comb. B: A rectangular sandstone block 2ft 5ins long, by 9ins broad and 8ins thick which was found built into a stone dyke not far from Tigh a' Bheannaich (ND05NW 9), near Shurrery (ND 03 57). 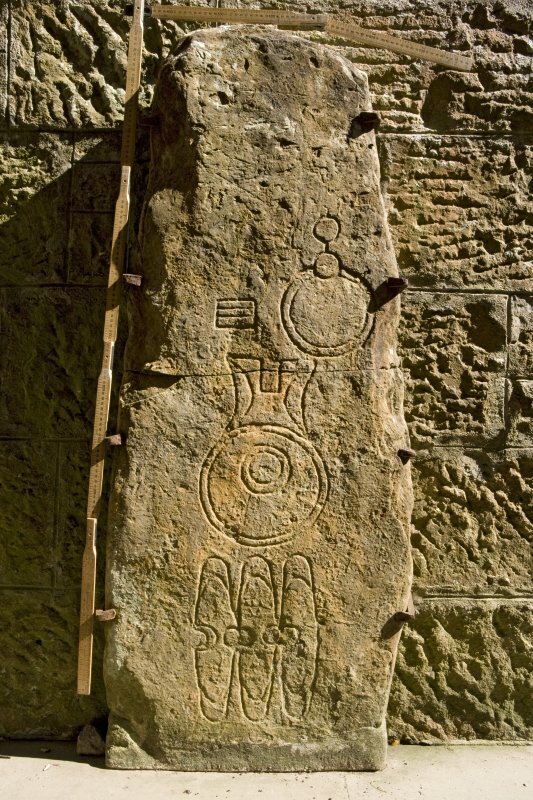 On the face of the stone is incised a small, stemmed circle or orb 4ins in diameter containing an equal-armed cross. The stem is 3 1/2ins long and 1 - 1 1/2ins broach. Beneath, and occupying the breadth of the stone, is a plain circle with a diameter of 8ins. J R Allen and J Anderson 1903; RCAHMS 1911, visited 1910. The symbol stones are as described and illustrated. Visited by OS (J B) 8 September 1981. 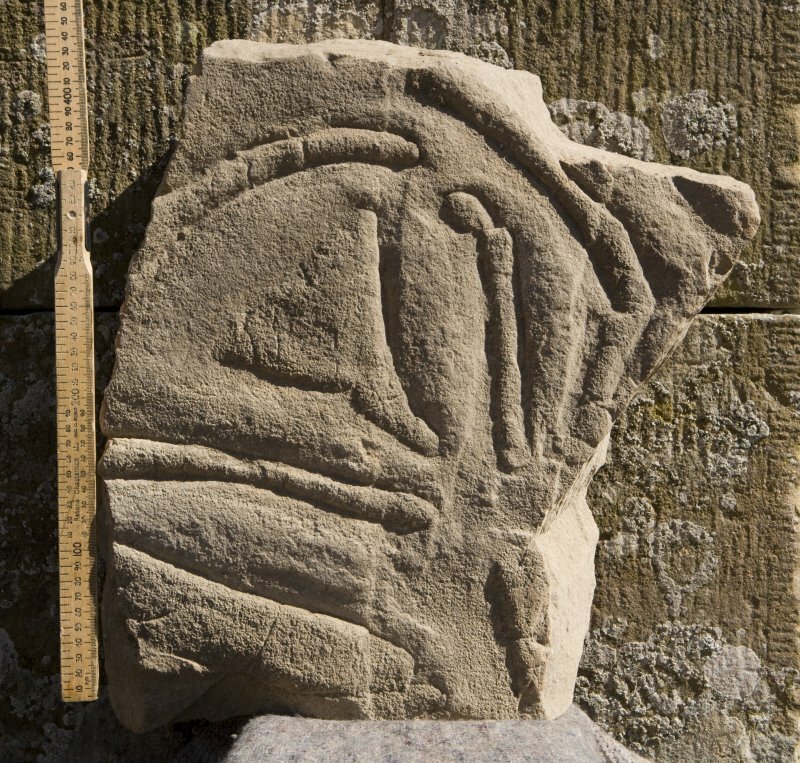 Only a detailed survey of Sandside House (NC96NE 11.00) would reveal whether any portions of these [stones] are incorporated in the present fabric. 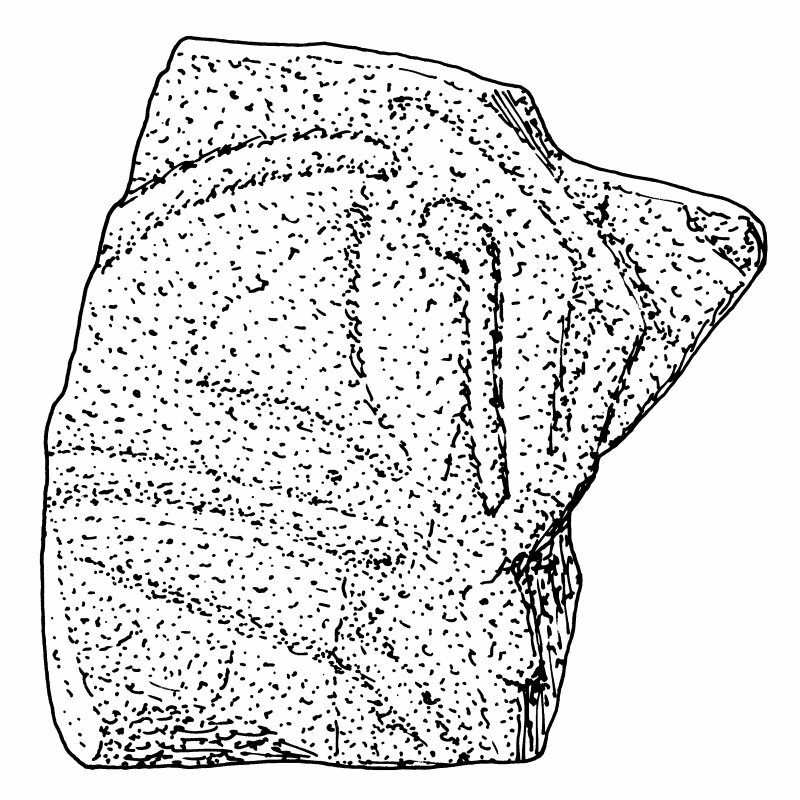 Class I symbol stone showing a triple-oval with a divided mirror-case and a mirror-and-comb.